Our energy system faces a fundamental transformation and renewable energies will play a dominant role in the future energy supply. One of the promising solutions is the use of solar thermal energy in buildings, for cooling, heating and domestic hot water preparation. Solar thermal systems for providing heat and cold to industrial processes show a high potential, too. In the last decade, the application of solar driven cooling systems achieved a significant progress. Steps forward have been taken in the design of system concepts to specific needs and in more reliable and efficient operation of the installed plants. New systems are available on the market and cover a broad range of cooling capacities and driving temperatures. 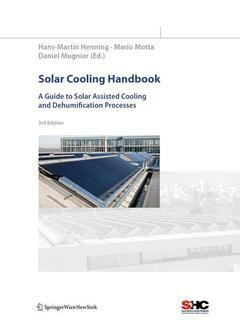 This handbook provides an overview on the various solutions to convert solar heat into useful cooling, reports about experiences made with realized installations and gives support in the design process. Its use will strongly contribute to achieve high quality solar cooling systems which provide significant energy savings and fulfil the users requirements in a safe and reliable way. Part 1 Introduction.- Meteorological data and Heating and cooling loads calculation.- Components of solar thermal systems.- Heat driven cooling technologies: Closed cycles.- Heat driven cooling technologies: Open cycle systems.- Solar cooling systems characterization.- Energy and Economic figures for solar cooling Part 2 Overall system design, sizing, design tools.- Solar thermal system design issues.- Pre-engineered Systems: Built Examples and Experiences.- Experiences from installed custom made systems.- Experience on DEC Systems.- Trends and new development.- Summary & outlook.